Awesome defensive magic! This is the only ingredient I know specifically used to keep yourself protected while you do your workings! 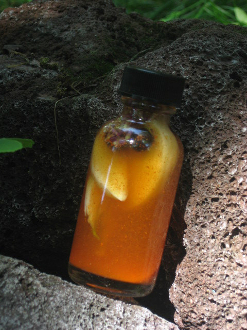 A must have for any hoodoo hunny or crafty witch! The primary purpose of this tonic/potion is to provide personal protection from disease and magical attack, especially if the attack is ongoing or you know a big whammy is about to be thrown at you. In addition, it is used to strengthen you and weaken your enemies while you work to drive away unwanted people or to make friends or family quarrel and among themselves. Great to use in salad dressing. Sprinkle or dash it against an enemy's doorsteps or serve it to an enemy as a condiment to protect yourself while you lay other tricks to get them out of your life. 1 ounce glass bottle. The story- According to herbalist Elizabeth Kastner, "During the height of the plague in France in 1721, it was discovered that the homes of disease victims were being ransacked. At first, no effort was made to find the criminals, since all knew they were fools, soon to die of the plague. "As time went on, it became apparent that the thieves were continuing in their raids... and quite inexplicably, avoiding falling victim to the disease. Soon, they became highly sought -- not due to their crimes, but in an effort to learn their secret. "When they were finally captured, they refused to speak until a bargain was offered: remain silent and hang. Divulge the secret to their resistance to the deadly plague and walk away. "It seems that the mother of several of the boys was a midwife and had a recipe which used plants which were easily wildcrafted... yet, she knew that this would change immediately if anyone learned the formula, so she swore her children to secrecy. Her sons saved their necks and shared the recipe for the disinfectant, which is still used in France to this day." thanks for looking! *curio only! this item is to be used internally at your own risk, and is not a substitute for mental, physical, or legal help. this item is not intended to prevent illness. i am not responsible for outcomes or reactions.